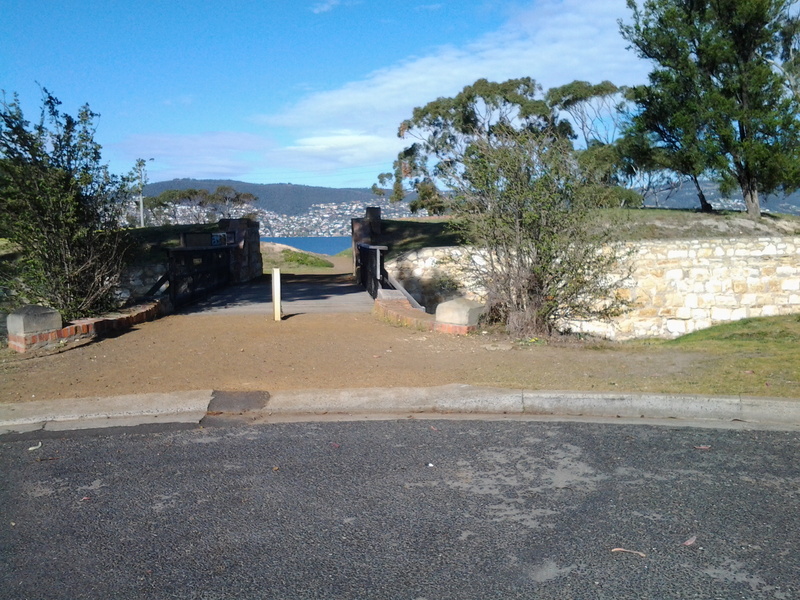 Near the end of my Stage 4 walk from Tranmere to Bellerive Bluff along the Derwent River, I saw a sign pointing to the Kangaroo Bluff Historic Reserve which I chose not to visit. However, my curiosity was aroused. So the next day, last Saturday, I made a special trip and walked to the Reserve to find out more. As I walked toward the entrance, I was puzzled. I could see a narrow road passing between two raised hills. 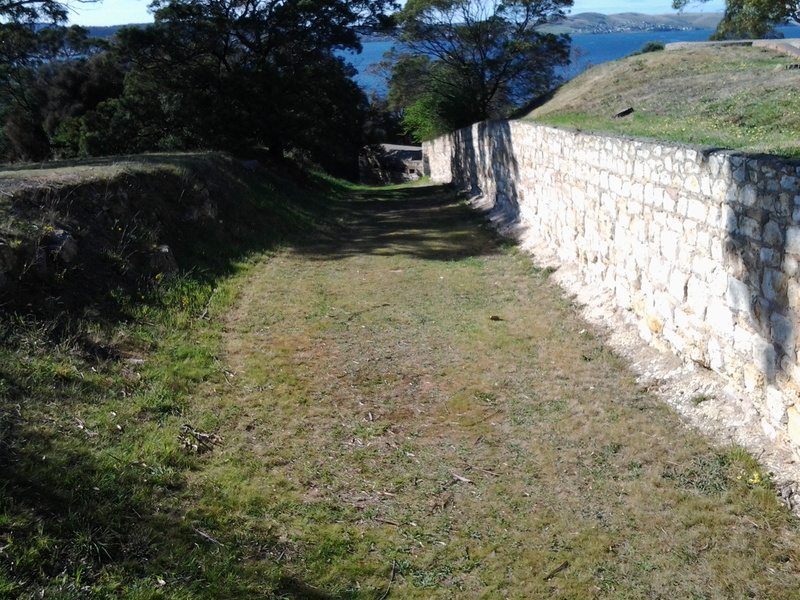 On closer inspection when I discovered a massive deep and long ditch from the left to the right outside the stone edged wall of earth, clearly this site was the remains of a fortification. 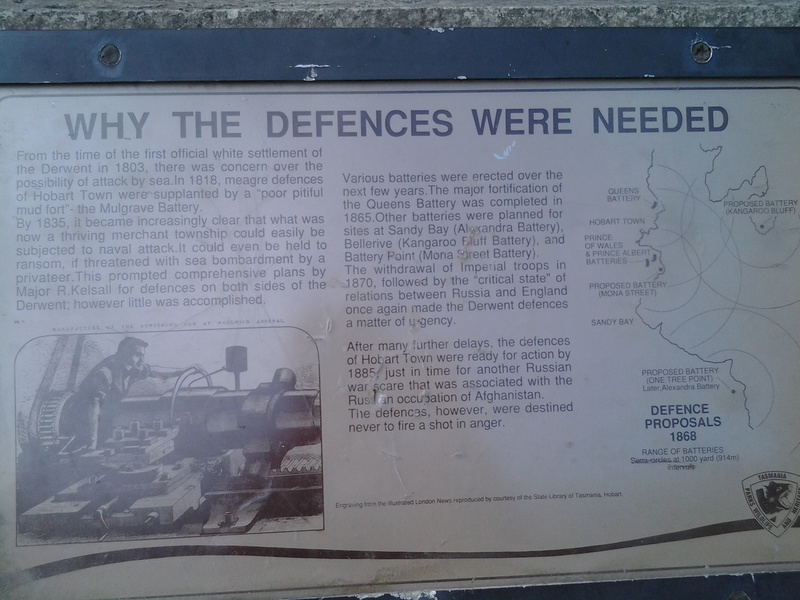 The site was a battery complex with underground tunnels and chambers for magazines, stores, the lamp room, a well and loading galleries. The public do not have access to the underground since these parts were bricked up in the 1920s: I would have been very interested to see the speaking tubes set into the walls used for communication purposes. However there are many metres of well-preserved channels which can be walked in and around. Signage provided useful information. 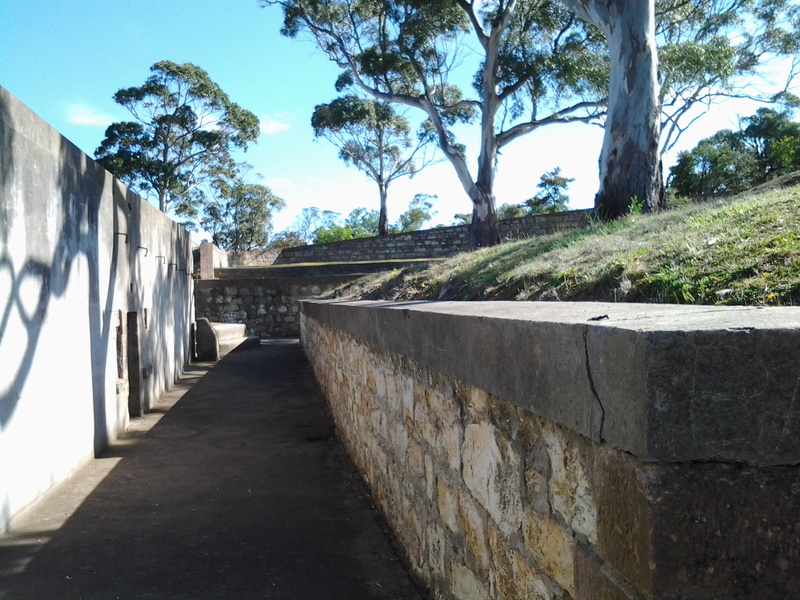 I now understand that the idea of a protective Fort was first discussed in the 1830s as a means to protect the merchant ships travelling up the Derwent River, although I am unclear who might have attacked from the sea because Van Diemen’s Land (now named Tasmania) was very isolated from the rest of New Holland (now named Australia). However, it was not until difficulties were being felt between England and Russia in the 1870s that a renewed push for a Fort was made. 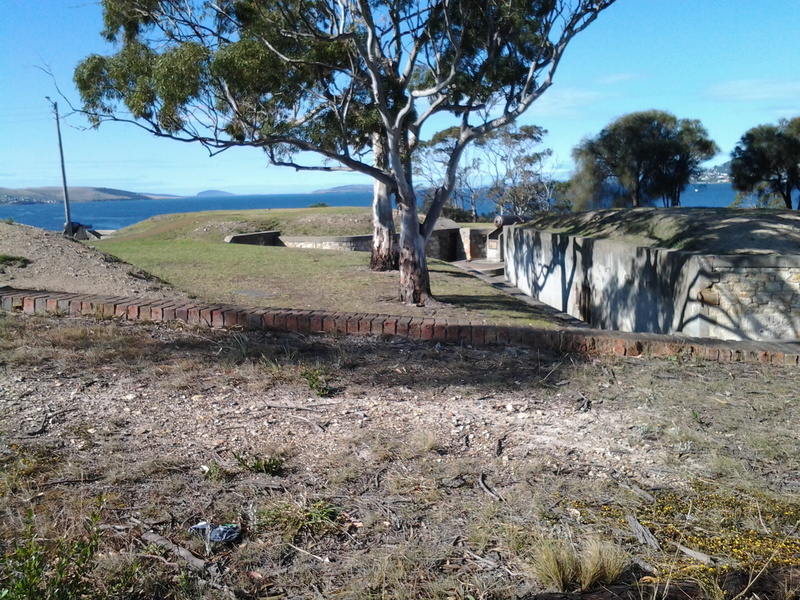 By 1885 the defensive Fort was built – although I cannot imagine why anyone would think that Russia would believe it useful to send a war ship to the tiny colonial and penal colony in Hobart. 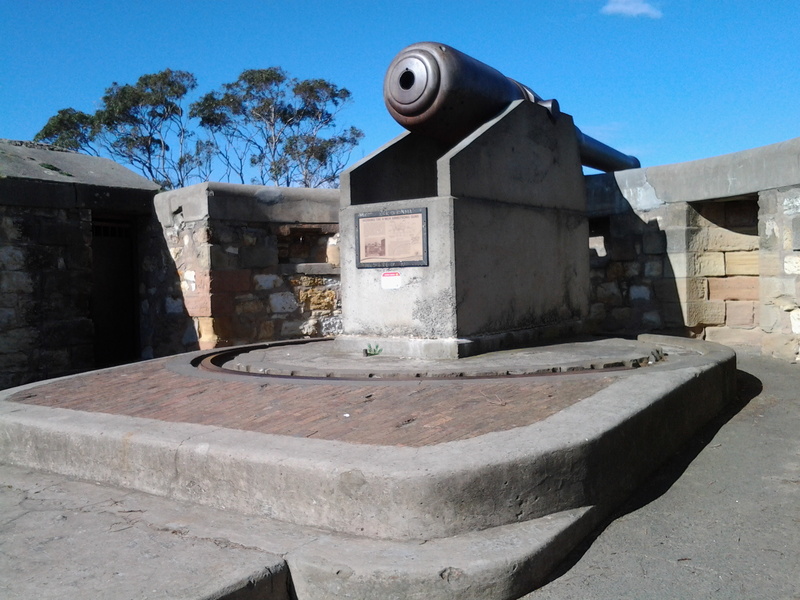 It does not surprise me that the two canons were never used as war weapon. 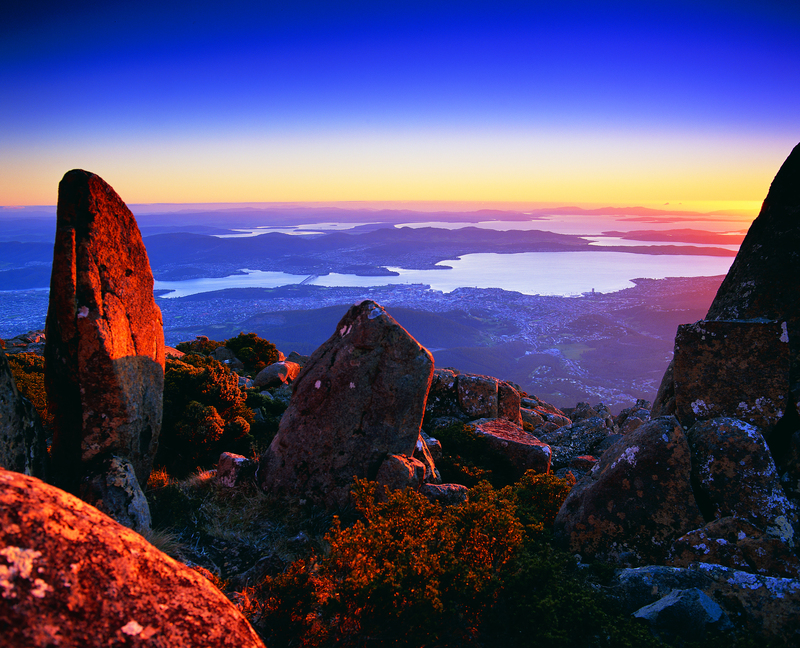 This entry was posted in Derwent River, Hobart, Mount Wellington, Walking and tagged Australia, Bellerive Bluff, Bellerive Fort, Derwent River, England, Hobart, Kangaroo Bluff Historic Reserve, New Holland, Russia, Tasmania, Tranmere, Van Diemen's Land on October 2, 2014 by Tasmanian traveller.